The origin of the name comes from the Dakota word chanhasen meaning "sugar-maple tree" (chan, tree; haza, a tree with sap). The northern metro area Hassan Township carries the latter syllable of the word to avoid confusion. Chanhassen was ranked as the #2 best place to live in America in 2009 by Money Magazine, and fourth among small towns rated as best places to live in 2013. Chanhassen is located at . According to the United States Census Bureau, the city has a total area of 22.88 square miles (59.26 km2), of which 20.44 square miles (52.94 km2) is land and 2.44 square miles (6.32 km2) is water. 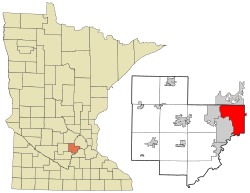 Although the bulk of Chanhassen is in Carver County, a small portion also extends into Hennepin County. U.S. Highway 212 and Minnesota State Highways 5 and 41 are three of the main routes in Chanhassen. Township 116 North, Range 23 West, Fifth Principal Meridian of the Public Land Survey System. According to data from the US Census Bureau the median household income (using data from 2008-2012) for Chanhassen was $103,462. For the same time period the per capita income was $46,305. Three percent of the population was living below the poverty line. As of the census of 2010, there were 22,952 people, 8,352 households, and 6,257 families residing in the city. The population density was 1,122.9 inhabitants per square mile (433.6/km2). There were 8,679 housing units at an average density of 424.6 per square mile (163.9/km2). The racial makeup of the city was 92.5% White, 1.1% African American, 0.1% Native American, 3.9% Asian, 0.9% from other races, and 1.5% from two or more races. Hispanic or Latino of any race were 2.3% of the population. There were 8,352 households of which 42.5% had children under the age of 18 living with them, 65.9% were married couples living together, 6.4% had a female householder with no husband present, 2.6% had a male householder with no wife present, and 25.1% were non-families. 20.6% of all households were made up of individuals and 6.3% had someone living alone who was 65 years of age or older. The average household size was 2.75 and the average family size was 3.23. The median age in the city was 39.3 years. 30.2% of residents were under the age of 18; 5.5% were between the ages of 18 and 24; 24.3% were from 25 to 44; 32.3% were from 45 to 64; and 7.7% were 65 years of age or older. The gender makeup of the city was 49.1% male and 50.9% female. As of the census of 2000, there were 20,321 people, 6,914 households, and 5,524 families residing in the city. The population density was 978.1 people per square mile (377.6/km²). There were 7,013 housing units at an average density of 337.6 per square mile (130.3/km²). The racial makeup of the city was 94.90% White, 0.75% African American, 0.15% Native American, 2.83% Asian, 0.41% from other races, and 0.95% from two or more races. Hispanic or Latino of any race were 1.98% of the population. There were 6,914 households out of which 51.1% had children under the age of 18 living with them, 71.2% were married couples living together, 6.2% had a female householder with no husband present, and 20.1% were non-families. 15.7% of all households were made up of individuals and 3.0% had someone living alone who was 65 years of age or older. The average household size was 2.94 and the average family size was 3.33. In the city, the population was spread out with 34.6% under the age of 18, 4.4% from 18 to 24, 37.0% from 25 to 44, 19.5% from 45 to 64, and 4.5% who were 65 years of age or older. The median age was 34 years. For every 100 females there were 100.5 males. For every 100 females age 18 and over, there were 97.3 males. 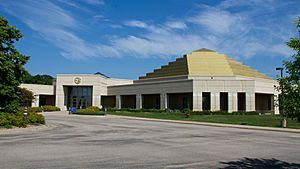 Chanhassen Dinner Theatres is the nation's largest professional dinner theatre, and the largest privately owned restaurant in the state of Minnesota. Since 1968, more than 200 plays have been produced and played to more than ten million guests. The city of Chanhassen places a strong emphasis on parks, open space, trails and recreation. Chanhassen prides itself on providing a comprehensive, multipurpose trail system. The city has built and maintains 70 miles of trails. Many of the city’s trails are located in natural resource corridors. The Chanhassen Skate Park was installed in September 1999. The park is located between City Hall and the downtown fire station. It features a wedge, quarter pipe, half pipe, hotbox, doobie roller, spine and grind rails. Many youth sports programs are offered through the Chanhassen Athletic Association, including baseball, softball, basketball, and soccer. Chanhassen is also home to the Chanhassen Red Birds amateur baseball team. Several well-producing lakes in Chanhassen keep the sportsmen busy year-round with fishing during the warm months and ice fishing when the lakes freeze-over. Both Lake Minnewashta and Lake Ann contain large and aggressive northern pike for the adept anglers. Chanhassen, Minnesota Facts for Kids. Kiddle Encyclopedia.